Pleasantly different from all others. pressure of 500 bar for big compressed gas steel bottles of up to 50 litres. In accordance with DIN 14 462, dry riser pipes in buildings must be subjected to inspections at regular intervals. The PFS can fill fire extinguishers from 1 – 12 kg from bigbags or silos. High-quality, antistatic materials, such as stainless steel are used for fabrication of the PFS. the basis of today's broad range of products and filling devices for fire extinguishers, corresponding testing and measuring equipment as well as tools and innovative high pressure fire extinguishing units. BRANDSCHUTZTECHNIK MÜLLER GmbH was founded by Herbert Müller in 1980. The company now consistsof th ree bu si ness segments and has a total of 65 employees. 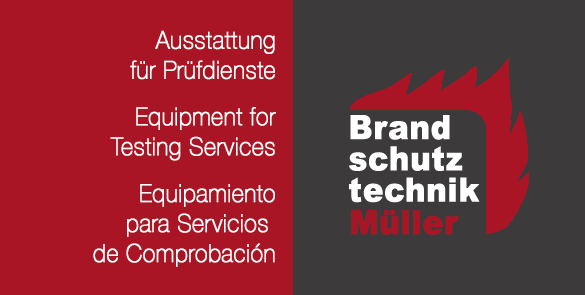 As a classical mechanical engineering company,BRANDSCHUTZTECHNIK MÜLLER manufactures equipment for inspection services. The firefighting equipmentsupplier is not only based at its main site in Zierenberg, North Hesse, but also in Günthersleben, Thuringia. Furthermore, the car agency for MAGIRUS GmbH has been a part of BRANDSCHUTZTECHNIK MÜLLER since 1980. Behind it stands a professional team - that is always there for you! Because of the success of our products , we are now looking for new distributors in other countries.